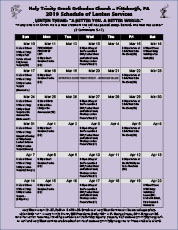 Worship calendars, schedules and forms to submit names for prayers. 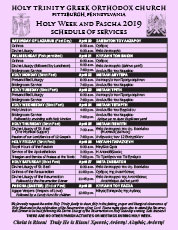 Form to submit names for commemoration of the souls of the departed during the Saturday of Souls of Pentecost weekend. 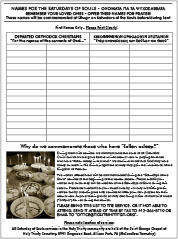 This is a fillable PDF that can be printed or emailed back to the Church Office. or brought to the service at the Saint George Chapel. Form to submit names for commemoration of the souls of the departed during the Saturday of Souls services during the Pre-Lenten and Lenten seasons. This is a fillable PDF that can be printed or emailed back to the Church Office. or brought to the service at the Saint George Chapel. 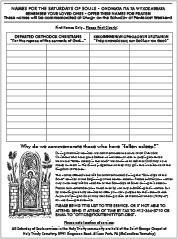 Form to submit names for commemoration in front of the Epitaphion (Tomb of Christ) on Holy Friday evening at the start of the service. 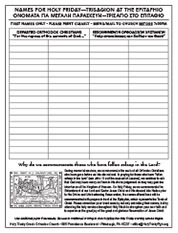 This is a fillable PDF that can be printed or emailed back to the Church Office. or brought to the service before the start of the service at 7:00pm.